What do you get when you take some of Vermont's most talented musicians, put them onstage together and watch them shred some classics? Answer: Select Sessions. A collaboration of Select Design, Signal Kitchen and Zero Gravity Craft Brewery, last Thursday's iteration — the eighth — of the concert series was a tribute to some of Motown's greatest. 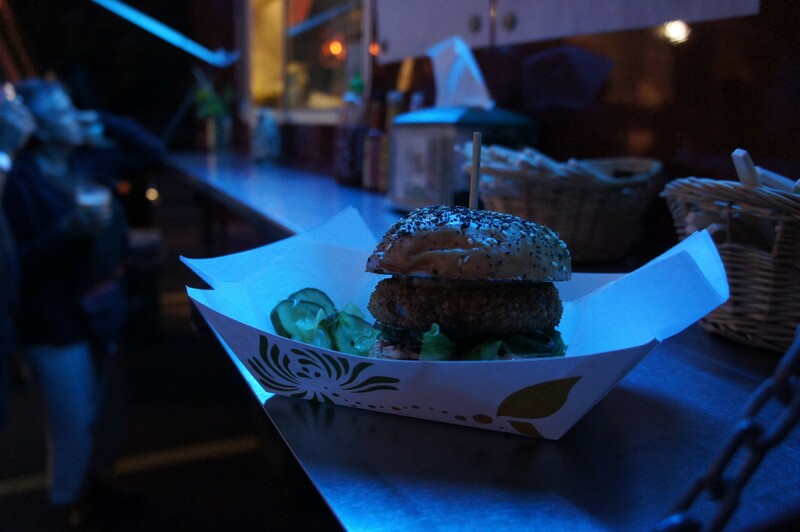 Luckily for me, the concert featured some soul-healing comfort food as well as music, and I surrendered to it all. As most of my food excursions begin, two friends and I biked a good ways down Pine Street Thursday evening with a cool breeze at our backs. After a quick peek at a smoky sunset at Oakledge Park, we followed the road back up to Select headquarters, just of Flynn Ave. A few guitar licks and muffled runs from a female vocalist escaped from a giant white tent, where the band was still tuning up. It was enough to get us excited for the night. We decided to head straight for the food trucks, hoping to fuel up for some funky dance moves later on. The Hindquarter and Dolce VT were parked adjacently and preparing for a sold-out show. The Hindquarter truck seemed like the best bet to satisfy our hunger, touting a menu of sandwiches loaded with meats and tasty fixings. We vowed to share the three sandwiches: the crispy duck, the steak sammy and the bahn mi. Slightly curious about the duck, I asked the cashier if she had tried it. "Sooo good!" was the response. I heard my name called out from the food-truck window, and three sandwiches were presented to us burger-style on everything buns and sided with sweet pickles. Wooden skewers held it all together as we searched for a spot to snack. The two picnic tables near the trucks were already at capacity, so we staked out a little patch of grass to sit down and enjoy the feast. My first bite was the crispy duck and definitely the mildest of the meats. The breaded patty of tender, ginger-garlic duck confit was dressed in marinated cucumbers, kimchi remoulade and greens. Though the ginger-garlic seasoning on the duck didn't jump out at me, I pick up on a subtle, gamey flavor that came through the buttery remoulade. I was happy to enjoy an American take on a French classic, but the dish lacked that je ne sais quoi. The steak sammy was my personal favorite, with its shaved pieces of marinated tri-tip steak garnished with tropea onions and chanterelles and drenched in aioli sauce. Amazingly, the smokiness of the steak stood up to the ultra creamy aioli, which was oozing down the side and beckoning me to take another bite. I liked the earthiness of the mushrooms and the sweet onions, too. The whole thing reminded me of a Philly cheese steak without the grease, but every bit as indulgent. My friends had a different idea about the champion of sandwiches. For them it was the bahn mi, which boasted a hunky, Korean chili pork shoulder dripping in a pork stock glaze. It was wearing pickled vegetables, cilantro and a healthy slathering of sriracha aioli. The meat was lightly charred and crispy on the outside, tender on the inside. The size of the pork shoulder was almost ridiculous — it would have required a fork and knife if we were trying to be polite. Good thing we weren't. Picking up the sandwich was a bit of a challenge, as the tangy, finger-lickin' sauces had soaked through the bottom half of the bun. It's the closest we got to real Southern barbecue, and we ended up leaving some of the bun behind in a race to finish the meat. 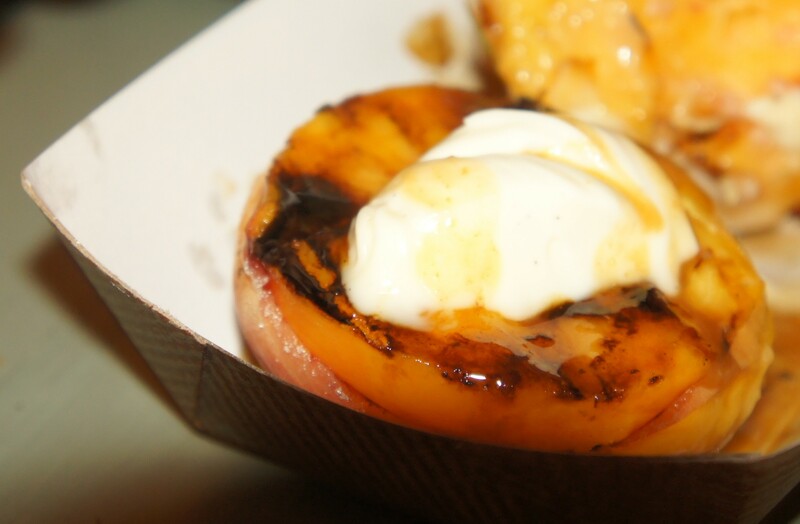 In keeping with Southern-inspired recipes, for dessert we split the grilled peaches from the Dolce VT truck. The two peaches were nicely charred and drizzled with a decadent salted-bourbon-caramel glaze. The crowning glory, though, was a dollop of vanilla marscapone that melted when our forks sank into the warm fruit. We passed the peaches around, taking turns digging in. The airy marscapone paired perfectly with the densely sweet peaches, and we all thought it hit the spot for a cool summer night. 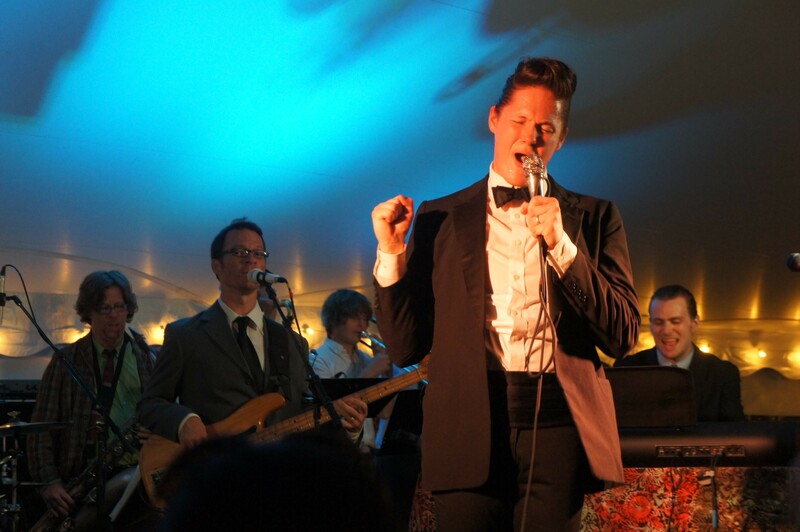 At 9 p.m., the concert kicked off as spiffed-up Josh Panda strutted onstage in a tuxedo and a greased-back pompadour. His partner, Kat Wright, stood coolly to the right wrapped in a sparkling silver dress bursting with pink flowers.The band looked classy, too. Veteran guitarist Clint Bierman and bass master Peter Day held down the grooves and helped with the harmonies. The real spark of the show came from Panda. He belted soulful singles in his signature vibrato, all while dancing nonstop and bopping to the beat. It looked like he might have been channeling his inner child, the one who sang into a hairbrush in front of the bedroom mirror. Throughout the show, the all-star lineup paid tribute to everything from Marvin Gaye's "I Heard It Through the Grapevine" and "Ain't No Mountain High Enough" to Stevie Wonder's "Boogie On, Reggae Woman" and Michael Jackson's "Blame it on the Boogie." It wasn't hard to sing and dance along with those songs, especially when the majority of the crowd knew every word. At times the tent and the music selection made the concert feel like big wedding with an exceptional live band. It was nice to let loose to some classic hits. Unfortunately, we couldn't boogie all night long, because of a strict noise curfew that cut the show off promptly at 10:30. Josh Panda reluctantly laid down the mic and everyone started going their separate ways. Panda was catching his breath when I met him at the side of the stage a few minutes later. I shook his hand and commended his performance. Then, out of curiosity, I asked him if he had known most of the songs prior to playing the show. "All of them," he answered, still a bit winded. "I grew up singing those songs, so when they asked me to sing them for the show, I said, 'Of course I'll do it!'" I'm quite glad he did.